Our area was named "One of the best small towns in America" by the Smithsonian Institution. Voted the 15th best small towns. We are rich in History, Menomonie derives its name from the native word for "Wild Rice People." The city was built along a marshy area ideal for growing wild rice- which is today's Lake Menomin. 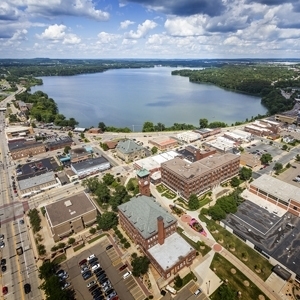 We are a vibrant western Wisconsin city right off I-94, just an hour east of the Twin Cities. Plenty of places to see, dine, shop, stay, visit and live. Use our hiking and biking trails, boat on our lakes, share in cultural activities and discover our hidden landmarks. Apple Farms, Corn Mazes, Farmers Markets, Antique Shops, Art Tours, State Trails (Biking, snowmobiling, car races, Freedomfest (July 4th)Rustic Roads, Cheese Factories. Listed on the National Register of Historical places to visit. Nearby attractions include: Wilson Place Mansion, Russell J. Rassbach Heritage Museum, and Caddie Woodlawn Park. We have a Mayo Clinic and Hospital, Marshfield Clinics in our region, as will as many other hospitals in Eau Claire. Jan 5.0 F° 14.5 F° 24.0 F° 0.8 "
Feb 10.0 F° 20.0 F° 30.0 F° 0.8 "
Mar 20.0 F° 31.0 F° 42.0 F° 1.8 "
Apr 33.0 F° 46.0 F° 59.0 F° 2.7 "
May 44.0 F° 56.5 F° 69.0 F° 3.6 "
Jun 53.0 F° 65.0 F° 77.0 F° 4.5 "
Jul 58.0 F° 69.5 F° 81.0 F° 3.9 "
Aug 56.0 F° 67.5 F° 79.0 F° 4.0 "
Sep 47.0 F° 59.0 F° 71.0 F° 3.8 "
Oct 36.0 F° 47.5 F° 59.0 F° 2.4 "
Nov 24.0 F° 33.0 F° 42.0 F° 1.9 "
Dec 10.0 F° 18.5 F° 27.0 F° 1.1 "
We have 4 Seasons here. We are truly a winter, Spring and Fall area. Summer is pretty short. Lots of snow in the winter, with colder tempertures. If, you like snowmobiling, sking, skating in the winter come join us. In the spring and summer we have many trails and are known for our bike trails on Red Cedar River State Trail. Condos Over 50 Communities Lots of rental due to College students coming and leaving. Beautiful country settings for lovely homes as well. Many job in medical field with a Mayo Hospital here. Manufacturing such as 3M. Anderson Windows, Walmart Distribution Center, Phillips Plastics, etc. Educational positions from CVTC in our area, and Also UW-Stout. Volunteer opportunites here at the Chamber for many events. Also, Stepping Stones food shelter.